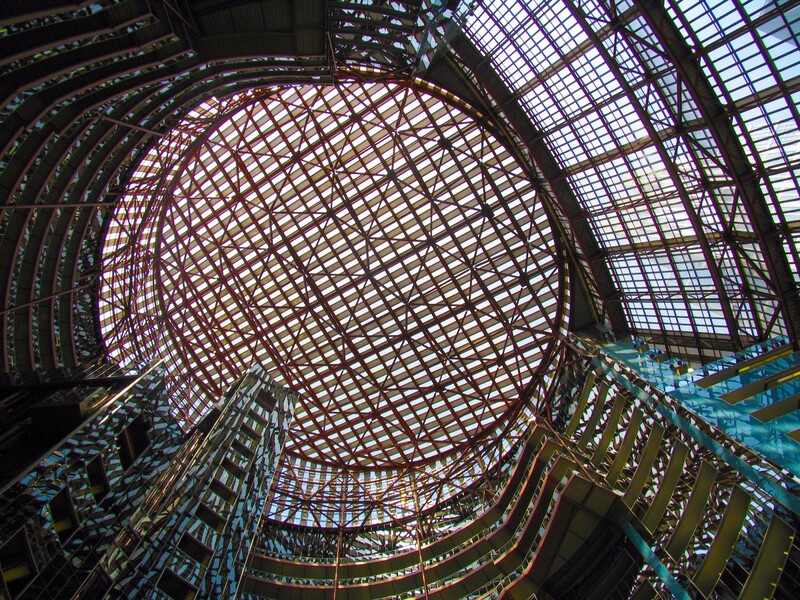 When you first encounter the Thompson Center, you might wonder if a UFO has landed in the middle of the Loop. The Helmut Jahn-designed center of state government is unabashedly Postmodern, with colorful details and a shape that references the dome of the state's capitol. 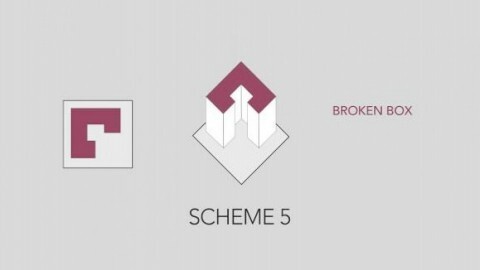 In addition to making a bold first impression, its design is intended to communicate a message. 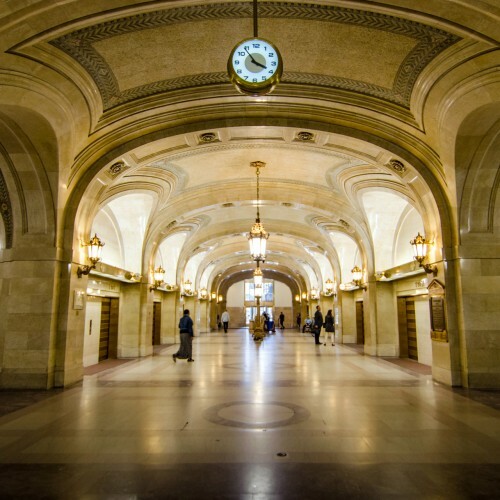 The openness and transparency of the building are meant to symbolize the state’s commitment to serving the people. 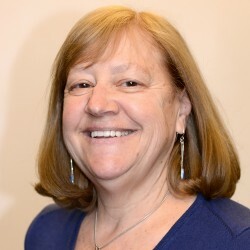 The building was supposed to have insulated double-pane glass, but much cheaper single-pane glass was used instead, leading to very high ongoing heating and cooling costs. 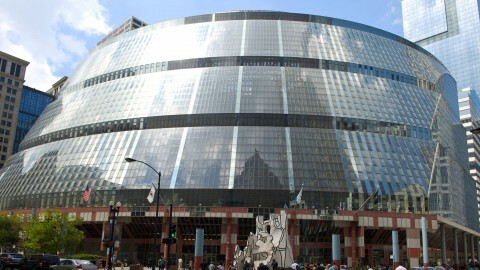 The Clark/Lake CTA station built into the Thompson Center, serving the Blue, Green, Brown, Pink, Purple and Orange Lines, is one of the three busiest in the system. 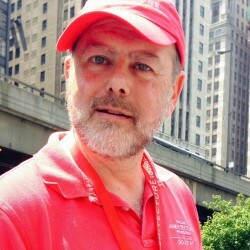 The Thompson Center is connected to the Chicago Pedway system, a network of passageways and tunnels linking many buildings and transit stations in the Loop. In the ’70s and ’80s, the North Loop Renewal Plan sought to reverse decades of decline in the area. 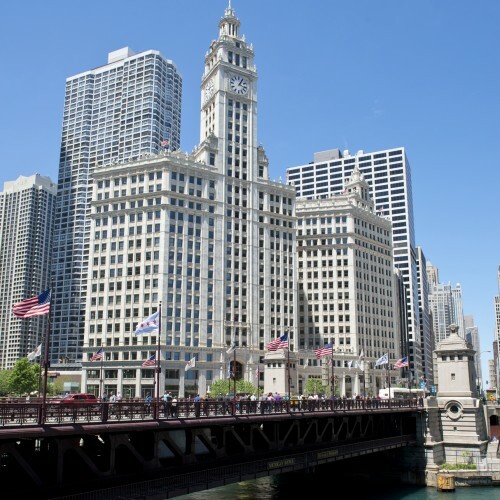 They took the opportunity to consolidate 50 different state of Illinois agency offices into one new building. 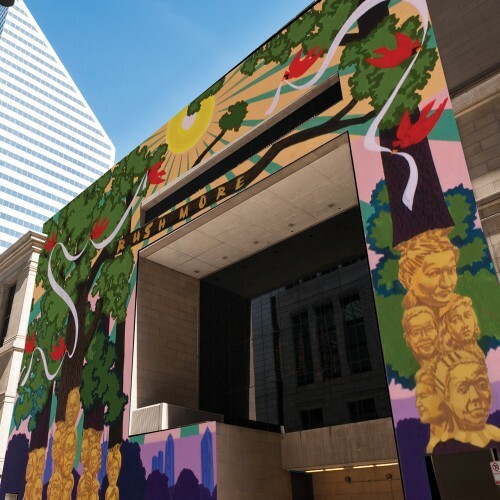 Joining three other major government buildings standing within a city block of each other, the Thompson Center was to be a “peoples’ center,” an easily accessible and inviting place to do business with the state of Illinois—as well as shop and dine. 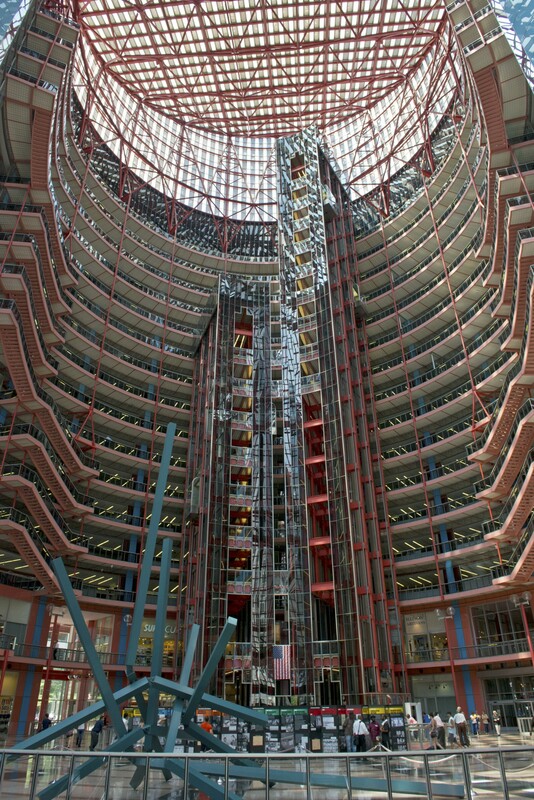 Visitors agree, the Thompson Center looks like a stadium or a spaceship from the outside, but marvel at the view inside. It is a unique addition to our built environment, bringing vitality and excitement to a government building and brilliantly demonstrating transparency as requested by Gov. 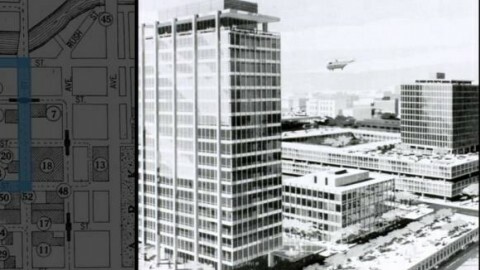 Thompson when the building was proposed. 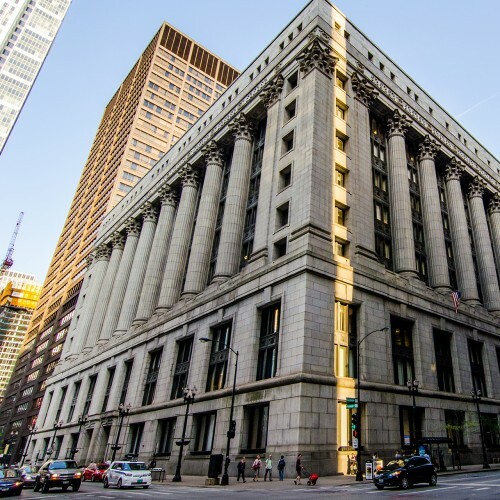 Tall, gridded walls face LaSalle and Lake streets, but on the other sides of the building, Jahn broke from the rigid straight lines of modernism. 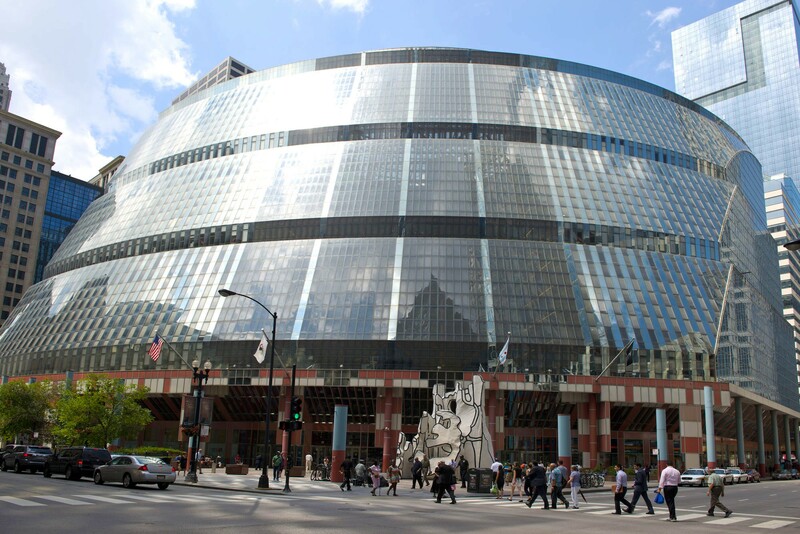 Hearkening back to the grand domes of earlier government structures, such as the state capitol in Springfield, the southeast profile of the Thompson Center is a slice of a hollow sphere, clad in curved blue glass and salmon-colored steel. The populist Postmodernism continues inside. 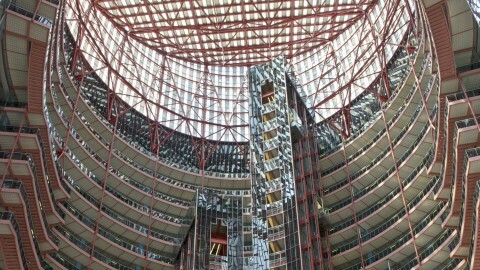 An enormous skylit rotunda, 160 feet in diameter and 13 stories high, is lined with balconies of open office space. 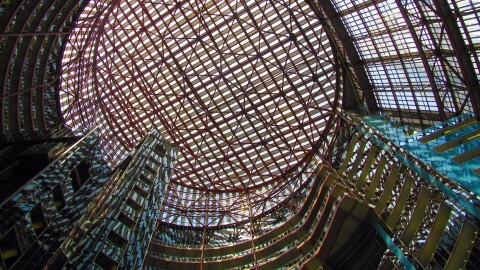 A circular cutout in the floor, 72 feet in diameter, opens onto a large food court, a Department of Motor Vehicles office and corridors leading to nearby buildings. A steady flow of people move around on escalators and exposed elevators, enlivening the space. 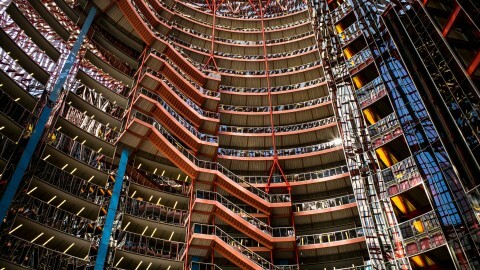 Helmut Jahn re-interprets the grandeur of government buildings with the Thompson Center. Its size complements the City Hall / County Building across the street, rather than dwarfing it as a skyscraper would. 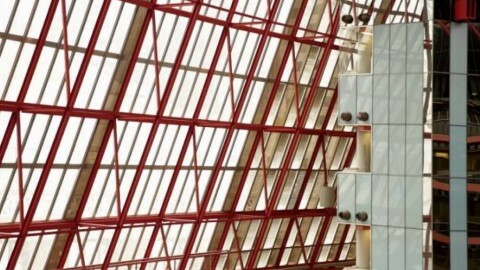 Jahn brings open space indoors into a grand atrium, a focal point akin to a capitol's rotunda. The office floors, escalators and glass elevators open into the rotunda, projecting a feeling of openness in state government. 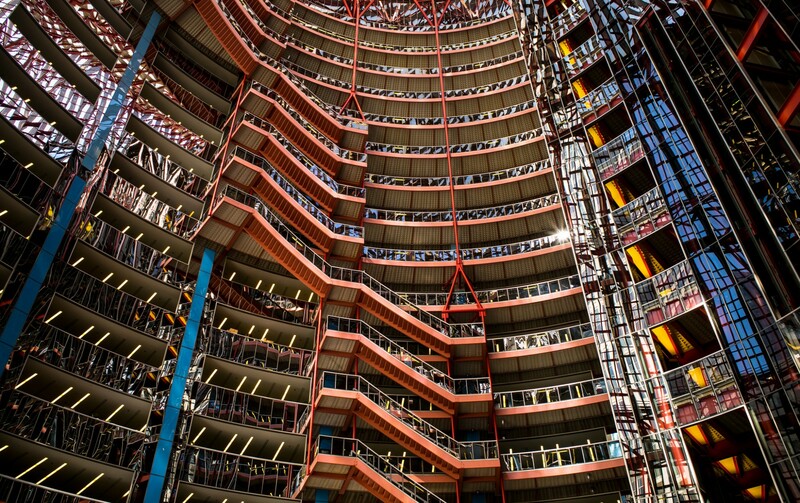 The Thompson Center bears some resemblance to a massive greenhouse, so keeping it cool is a challenge. An innovative system of thermal storage helps. 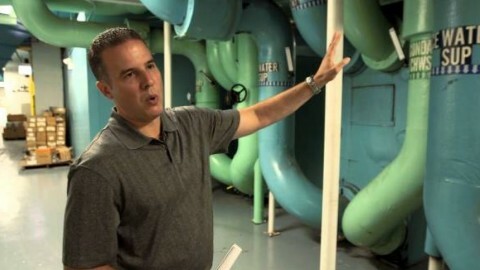 Chillers create ice slush overnight, when electricity prices are low, and store the slush in basement tanks. The slush is used to air condition the building during the day and is then re-frozen at night.